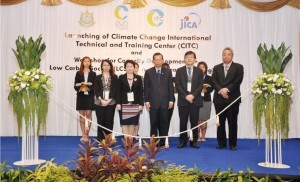 The Thailand Greenhouse Gas Management Organization (TGO) inaugurated its international technical and training centre on 8 May 2014. More than 70 participants took part in the opening ceremony, including several LoCARNet researchers and practitioners, namely, Dr. Shuzo Nishioka (IGES, Japan), Prof. Ho Chin Siong (Universiti Teknologi Malaysia), Assoc. Prof. Sirintornthep Towprayoon (Joint Graduate School of Energy and Environment, Thailand), Prof. Rizaldi Boer (Bogor Agricultural University, Indonesia), Dr. Nguyen Tung Lam (ISPONRE, Viet Nam), and Mr. Hak Mao (Kyoto University and Ministry of Environment, Cambodia). 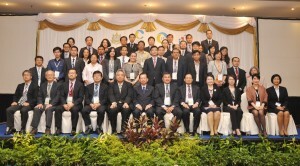 At the opening ceremony and at the commemorative seminar and the training needs assessment workshop that followed, participants from ASEAN countries shared current obstacles and bottlenecks, based on their experiences, actively exchanged their views on the necessity of capacity development on low-carbon development in Asia, and expressed their main expectations for CITC. It is hoped that CITC will become a one-stop technical and training centre on climate change mitigation and adaptation in this region, contributing to the formation in the near future of a network open to multi-stakeholders, especially policymakers and practitioners. In this regard, LoCARNet will aim to collaborate further with CITC and to link research with policies and actions, by reflecting research results into the content of CITC training.